CTU members overwhelmingly ratify UNO/Acero tentative agreement | Fight Back! CTU members employed by Acero approved the agreement Friday, December 14, with 98% voting in favor. Of 485 votes cast, 474 union members voted yes. Voting took place by secret ballot in Acero's 15 schools. The new contract mandates equal pay for equal work by matching Chicago Public Schools (CPS) teacher salaries, class size reductions, new special education safeguards and sanctuary school protections for the charter’s majority Latinx student population. "We said from day one that this strike was about educational justice for our students and their families, and the contract our members overwhelmingly approved advances that cause," said CTU President Jesse Sharkey. "But we've also shown Chicago and the nation that the collective power of teachers, paraprofessionals, students and communities can transform not just our classrooms but an entire industry." 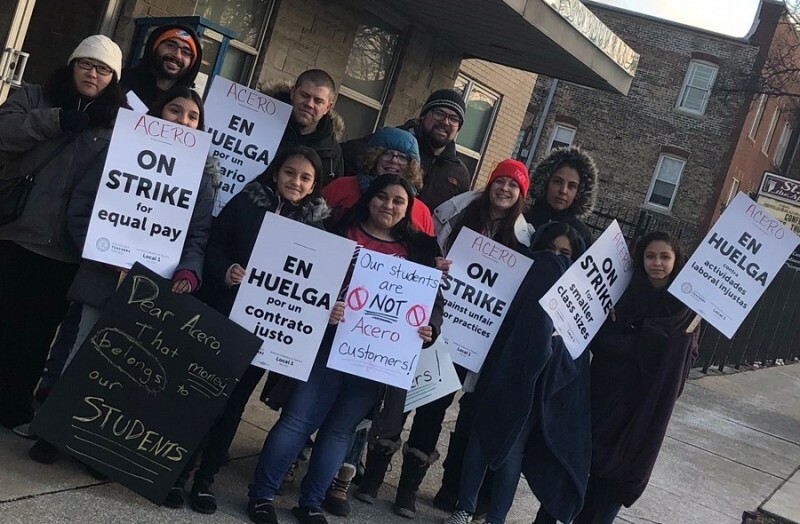 The contract ratified by Acero/CTU educators and paraprofessionals includes enforceable class size reductions and management penalties for class size violations. It also features management commitments to comply with special ed laws and staffing levels, which have been a chronic problem in both CPS charter and district schools, protecting resources for the schools' most vulnerable students. It provides for equal pay for equal work with CPS educators, who teach the same students but whose compensation has been significantly higher than those working for private charter operators. Sanctuary school protections, including language enshrined in the contract that bars schools from asking students about their family's immigration status, and that bans ICE from school property or access to student records without a legal mandate are also a part of the contract. "I'm so proud of our teachers and paraprofessionals and all the parents and students who walked the picket lines with us in the cold each morning," said Martha Baumgarten, a fifth-grade teacher and member of the bargaining team. The strike drew national attention from educators and labor leaders who recognized the historic significance of challenging the influential business interests and corporate elites that promote charters as a cornerstone of their school privatization agenda. It also comes as Chicago's charter industry is losing one of its biggest backers, outgoing Chicago mayor Rahm Emanuel. Acero's board of directors is expected to ratify the contract in the coming days. 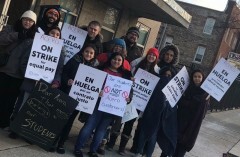 CTU members are currently bargaining for new contracts with ten other charter operators, and educators at four CICS charter schools have voted to authorize a strike. CTU members at CPS district schools expect to begin bargaining a new contract in January.